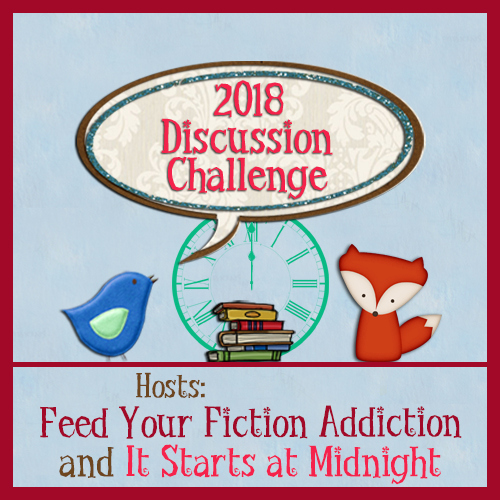 I’m excited to be participating in the Book Blog Discussion Challenge hosted by Nicole @ Feed Your Fiction Addiction and Shannon @ It Starts at Midnight for the first time this year! I’m so glad I found this one because I’ve been hoping to start working on more discussion type posts. Somewhere along the way, I just got in a huge rut and it really affected my blogging this year. I’m hoping this challenge will help me focus more on some of the things I really want to talk about and get some more back and forth going on the blog and making things interesting again! I’m only challenging myself to 1-10 discussion posts because this is something new for me and I don’t know how it’ll go and also because I know there will be a couple of really busy months for me this year and I don’t want to stress myself out by requiring anything of myself on the blog those months. I’m hoping to be active all year but I’m also trying to be realistic. So I’m going for Discussion Dabbler and will consider anything over that extremely exciting! I don’t have any ideas quite yet or topics I’ll definitely be discussing, but I’ll link to the posts here when I’ve written them!